O.K., fund officials didn’t use quite those words, but they came close, with an article in IMF Survey magazine titled “Ease Off Spending Cuts to Boost U.S. Recovery.” In its more formal statement, the fund argued that the sequester and other forms of fiscal contraction will cut this year’s U.S. growth rate by almost half, undermining what might otherwise have been a fairly vigorous recovery. And these spending cuts are both unwise and unnecessary. There are a few Democrats who have upheld the party’s tradition of championing civil liberties – such as John Conyers (Mich.), who is introducing a bill with conservative Rep. Justin Amash (R-Mich.) to curtail the program, and Sen. Jeff Merkley (D-Ore.), who with Sen. Mike Lee (R-Utah) introduced legislation backed by eight senators requiring more disclosure of secret court rulings. Just because the authorities have taken private data from Facebook doesn’t make it right. The federal government is not a grocery store or a social networking site. The government has a special relationship with its citizenry. The terms of that relationship in the US are spelled out in the Constitution of the United States of America. The right to be “secure in our persons, homes, and papers” has a long history of protection in the United States. In response to the tyranny of British rule, this country was founded on principles that embody freedom from government intrusion in our lives. Unless and until the government – in the form of police, federal agents, or a prosecuting attorney – can show that there is probable cause to believe that a person is engaged in criminal activity, we have rights against the government (what legal scholars call “negative rights”). This can be thought of as the list of things that the government may not do to you or take from you without proving to a judge that they may take it from you. And you are entitled to a fair determination on that question – this is your “due process” right. What can’t the government take from you without due process? Your property, your life, and yes, your privacy. I have argued above that our clicking behaviour is valuable, so you might think of your internet footprint as your property. But, lately the lines have blurred. The old, stylized picture of what liberals and conservatives want of government doesn’t mean much, especially to younger Americans, because they have seldom experienced it. Conservatives keep claiming liberals want a “cradle to grave nanny state.” That rhetoric has distracted us from the real social re-engineering taking place all around us. The right, along with its “centrist” collaborators, is transforming our nation into a bloodless and soulless Randian State. Their decades-long assault on our core social values is on the verge of consuming its first complete generation of Americans. Born at the dawn of the Reagan era, Millennials were the first to be fully subjected to this all-out attack on the idea that we take care of each other in this country, and they’ll pay for it from the cradle to the grave. Some of us are the parents of Millennials. On this Father’s Day it’s hard not to wonder: Who’ll fight with them, and for them? On this day in 1885, the Statue of Liberty, a gift of friendship from the people of France to the people of the United States, arrives in New York City’s harbor. The Statue of Liberty (Liberty Enlightening the World, French: La Liberté éclairant le monde) is a colossal neoclassical sculpture on Liberty Island in New York Harbor, designed by Frédéric Bartholdi and dedicated on October 28, 1886. 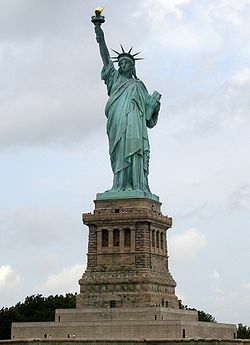 The statue, a gift to the United States from the people of France, is of a robed female figure representing Libertas, the Roman goddess of freedom, who bears a torch and a tabula ansata (a tablet evoking the law) upon which is inscribed the date of the American Declaration of Independence. A broken chain lies at her feet. The statue has become an icon of freedom and of the United States. Citi Bike officially launched to annual members on Monday, May 27. As of 5 p.m., members had made more than 6,000 bike trips, and traveled over 13,000 miles – greater than half the Earth’s circumference! Visit Citi Bike’s blog for more stats, facts and tips. Membership opens to daily and weekly users on June 2. Well, it opened to people taking out an annual membership on May 27, but I don’t live anywhere near New York, so if I get to use it, it will be as a “daily or weekly” user.